The 1860's is one of my favorite fashion era's. Probably because of the big skirts. I've always loved big, poofy, and frilly skirts. 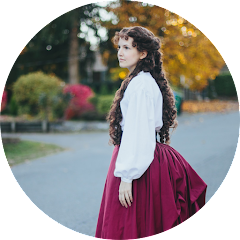 On my other blog, Tiana's Treasures, I wrote a little about the 1860's day dress. You can check that post out HERE if you want to. I thought I would share a few of my favorite 1860's dress that I've found on Pinterest. All images will link back to the original source. Silk moiré ballgown with metallic gold appliquéd hem border, c.1860. I just thought this dress was so pretty! This is what was written about this dress on the page it's from. Starched organdy dress, 1865. Typical of mid-19th century styling, the very full skirt was worn over a hoop petticoat and is further widened by layers of ruffles. The starch used on this garment has discolored it over time. This dress was worn by Marianna Heyward (b. 1844) when she married Benjamin Walter Taylor on December 14, 1865. This dress is one of my favorites! If I ever make a reproduction of a dress from this era I would probably replicate this one. Be sure to check out the site this one came from. At the top of the page they have silhouettes from different era's that will take you to pictures of clothing from that time. I love the purple color of this one! This one's from 1864.